Gerry Adams Arrest: Where now for the peace process? In January 1972, Arthur McConville died of cancer, leaving his wife Jean to care for their ten children. Born Jean Murray to a Protestant family in the Avoniel area of East Belfast, she converted to Catholicism to marry Arthur. 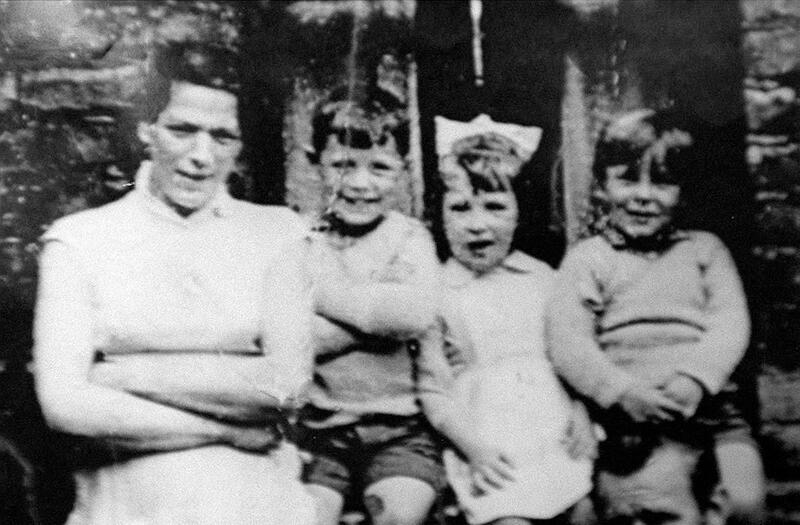 The McConville's had moved into the Divis area of West Belfast in 1969 after being intimidated out of their home by loyalists. The Divis area, as with much of the Lower Falls, was a stronghold of the Official IRA, although the Divis flats would become known as the "Planet of the Irps", a play on the IRSP - Irish Republican Socialist Party, aligned with the Irish National Liberation Army - after they split from the Officials in 1974. According to a report filed to the Police Ombudsman by her children, McConville had been the victim of intimidation and was acquiring a reputation as an informer. On one occasion, she reported to an army patrol that she had been attacked and was told by her attackers to stop informing. This was in late November 1972. On 7 December, she was kidnapped from her home at gunpoint, apparently by four females. She was taken to a remote location in the Republic of Ireland, tortured, killed and buried in a secret location - Shellinghill Beach in Louth. After their mother was taken, the youngest nine children were cared for by their 15 year old sister, Helen, until social services learned of the situation and forcibly split up the family. The tragedy of the McConville family was compounded in 2010 when it was alleged that Dolours Price had given an interview to the Boston College project and admitted her role in the abduction of McConville. The controversy over the Price interview, in particular her personal health at the time, has been discussed in an earlier post. Of particular relevance was the accusation that the order to disappear McConville had come from Gerry Adams. At the time, Adams was a young leader in the republican movement. He has always denied being in the IRA, but if you spend long enough talking to former members, you will acquire a body of rhetorical evidence which suggests otherwise. The "Voices from the Grave" account of Brendan Hughes was particularly revelatory about Adams's role in the IRA: accusing him of ordering the Bloody Friday bombs in central Belfast on 21 July 1972 which killed eleven. Hughes, on page 129, comments: "there was only one man who gave the order for that woman to be exectured. That...man is now the head of Sinn Fein." There were sixteen "Disappeared" people over the course of the troubles. The IRA admitted being responsible for nine of them (Eamon Molloy, Seamus Wright, Kevin McKee, McConville, Brendan McGraw, John McClory, Brian McKinney and Danny McIlhone). McConville was the only female disappeared by the IRA. Only seven bodies have ever been recovered. Perhaps the most famous of those remaining disappeared is Captain Robert Nairac, whose abduction, torture and murder have become established as fact despite the lack of a body. Most of those disappeared were Catholics, suspected of informing on the IRA's activities. In some cases, they were IRA volunteers, often young and naive, who had been convinced or forced to cooperate with the security forces by providing information on republican activities. The Smithwick Tribunal, held in Dublin into allegations of collusion between the Irish Gardai and the IRA, heard that one in four IRA members was involved in such cooperation. One cannot help but wonder exactly what it was that McConville was doing that was found to be so objectionable by the IRA leadership, in particular by Gerry Adams that would necessitate her disappearance. She wasn't in the IRA, so could only ever have been privvy to second hand information through the form of street chatter, and it has been established that she was not trusted by many of her neighbours so the chances of her being able to provide any top level intelligence is surely slim. Some reports have suggested that McConville's aiding of an injured soldier had in some way angered republicans in the lower Falls. Even this seems like a stretch to justify not only her killing, but her disappearance. The McConville disappearance was perhaps the single most brutal and callous act of the Provisional IRA's entire campaign. The deliberate and calculated torture and murder of a widowed mother of ten can not be justified as an act of war, as could - at a stretch to conventional morality, of course - a bomb in a city centre, or the shooting of a police officer. Indeed, disappearance can be considered to be a war crime - one that would not fall under the jurisdiction of the Good Friday Agreement and its prisoner release programme. Gerry Adams was arrested at Antrim PSNI station on 30 April 2014, a matter of weeks after Ivor Bell was also arrested for questioning in relation to the McConville disappearance. Bell, according to Brendan Hughes (Voices from the Grave, p. 130), had argued for McConville's body to be left in the street. Friday 23 May will see elections held in the Republic of Ireland. Adams arrest coincides with these elections in such a way as to refute the possibility of coincidence. It should, of course, be noted that Sinn Fein offered the PSNI the occasion of an Adams visit during which he could be questioned about the McConville case - an attempt to get ahead of the story, as it were. These attempts have been spectacularly unsuccessful thanks entirely to his immediate arrest and detention. Today, Saturday 3 May, Sinn Fein organised a demonstration with placards depicting Adams and Nelson Mandela with the message "defend the peace process; release Gerry Adams TD". While the Adams arrest is indeed a highly politicised move and one that will, in all likelihood, lead nowhere, the depiction of Mandela at a time when the kidnapping, torture and killing of a widow mother of ten is the issue at hand seems callous at best. There is of course a threat to the peace process. The Provisional IRA, inactive as it has been for nearly twenty years, retains local power in the nationalist communities of Northern Ireland. While many young activists have joined the so-called "dissidents", there is a structure to the Provisional IRA that remains. The threat that it carries, however, is limited by the developments in security since its most recent ceasefire in 1997. Mi5 has a considerable presence in Northern Ireland, based at Holywood Barracks just outside East Belfast. The security forces have been largely successful in limiting the dissident campaigns of violence and it seems unlikely that the hypothetical return of the Provisional IRA would pose a significant challenge to them. The army is withdrawing from Afghanistan and has very recent and very useful experience in combating a foe far more ruthless and inventive than the Provisional IRA ever was. The question must also be asked: is the Provisional IRA ready and willing to take on British regiments fresh from fighting the Taleban? They will of course recall that they did not fare so well against the SAS once that regiment was deployed to Northern Ireland - all debates about the ethics of the SAS deployment to Northern Ireland aside. Loyalist marching season is just around the corner, with all the violence and intimidation that it brings on an annual basis. If the situation remains unresolved past the end of May and if hostility is allowed to brew and fester, then there will be serious issues awaiting us in the summer months. It is imperative that the political leaders of Northern Ireland finally offer some leadership and do not allow this to happen. Some have suggested that a rift between Peter Robinson and Martin McGuinness, only marginally odder bedfellows than Robinson's predecessor Ian Paisley, has grown and is exemplified in their respective positions on the Adams arrest. Neither has provided their communities - particularly those within them who are predisposed towards violence - with anything like adequate leadership on the overriding problem of the peace process. Too many have assumed that the Northern Ireland peace process is a done deal. British and Irish politicians selling themselves as "peace experts" to divided societies around the world is testament to that. They have ignored Northern ireland for too long, which is bad enough, but the fact that politicians in Northern Ireland have done the same is frankly criminal. Engagement with community leaders is a must. Establishment of a fair and just format to "deal with the past" is a must. The NI21 party has suggested that a line should be drawn in Northern ireland's troubled past and nothing should be revisited. This is a compelling argument: we all move on together for the betterment of our collective future. But it is also a very easy argument to make when you weren't orphaned at 6 years old after your mother was disappeared by men who now sit in positions of political power. It's also very easy if your young daughter wasn't shot dead by the army on her way to school. A better solution has to be found. The purpose of this website is to publish the research of Andrew Sanders and was initially funded by the John Moore Endowment Fund through the UCD Foundation. The homepage banner image is courtesy of Sinn Fein.